Slicers provide buttons that you can click to filter table data, or PivotTable data. In addition to quick filtering, slicers also indicate the current filtering state, which makes it easy to understand what exactly is shown in a filtered PivotTable. You can use a slicer to filter data in a table with ease. Select the fields you'd like to filter. Select OK and adjust your slicer preferences, such as Columns, under Options. Note: To select more than one item, hold Ctrl, and then select the items that you want to show. Select and hold the corner of a slicer to adjust and resize it. Select Clear Filter to clear the slicer filter. Note: In order to use a slicer, you must convert your data into a table first. 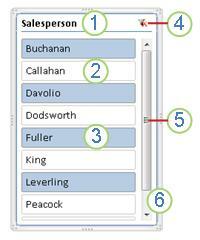 This displays the PivotTable Analyze tab. On the PivotTable Analyze tab, click Insert Slicer. In each slicer, click the items on which you want to filter. To select more than one item, hold down Command, and then click the items on which you want to filter. This displays the Table tab. On the Table tab, click Insert Slicer. A slicer is displayed for every field (column) that you selected. This displays the Slicer tab. On the Slicer tab, click a colored style that you want. On the Slicer tab, click Report Connections. In the dialog box, select the check box of the PivotTables in which you want the slicer to be available. Click anywhere in the PivotTable for which you want to disconnect a slicer. Click the PivotTable Analyze tab, and then click Filter Connections. Control-click the slicer, and then click Remove <Name of slicer>.